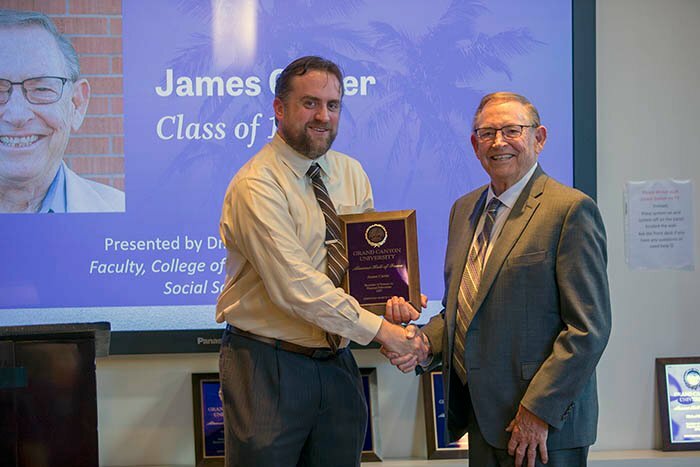 Every time Jim Carter visits the Grand Canyon University campus, he thinks about the impact it has had on his life. Carter never envisioned that career path as a teenager in the early 1950s, when he had nothing more than big dreams and a determined spirit. Fortunately, God had other plans, too. Carter was playing softball at his church, Southern Temple, at the same time Dr. Dave Brazell was starting a baseball team at what was then Grand Canyon College. Brazell invited Carter and his friend Sam to try out. Carter remembers the day, right down to the time (2 p.m.), date (Aug. 3, 1953) and place (Monterey Park) – emphasis on the time and date. “Boy, was it hot,” he said. He also was a hot prospect, as it turned out, and Brazell gave him a scholarship. But not only was Carter an athlete; he also was a Christian and a servant leader – perfect for Grand Canyon. As a junior and senior, he served in student government and became vice president. He graduated with a Bachelor of Science in Physical Education in 1957. After graduating, Carter was a teacher and coach at Sunnyslope High School for four years while earning a master’s degree. Then God pointed him in a different direction when he decided to go to law school. Carter went on to become Assistant City Prosecutor for the City of Phoenix and held that position for seven years before he was appointed Chief Prosecutor for two years. He quickly ascended to the civil side, where he was in charge of the real estate division. Through that experience, Carter was appointed to the judicial faculty of the limited jurisdiction courts, handling criminal cases. Carter retired in 2005 and recently decided to serve once a week as a pro tem judge. Faith Weese, Chief University Relations Officer, has known Carter for years. “He is very honest, loving and more emotional than people think because he is a tough judge,” she said. “But under all the toughness, he is a softie. While Carter’s professional accomplishments are remarkable, Carter credits his wife, Ginger, for his success and happiness. He gushed about his love for her with no hesitation. The couple met at GCU when Carter was a sophomore and Ginger was a freshman. They were married by Carter’s bible study professor on March 7, 1957, and raised two daughters. They now have three grandchildren. Carter’s connection to the University remains strong, and his hope is that the generations to come never lose sight of the legacy that was started by its alumni.